This page contains a guide for the Koopa Troopa Challenge in Super Mario Odyssey. The guide also contains the prizes that you can obtain in the mini game. The Koopa Troopa Challenge is a collection of mini games found in Super Mario Odyssey. 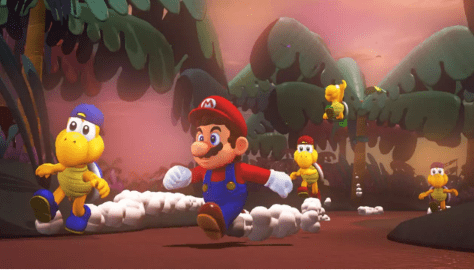 There are several different Koopa Troopa Challenges scattered around the world of Odyssey, with every single challenge varying in style and mechanics. You can find one of these challenges in the Forgotten Isle (Palm Tree Kingdom), wherein you have to compete against a number of Koopa Troopa to reach the finish line first. You can get a Power Moon for each Koopa Troopa Challenge that you complete. It is also possible for you to compete online to get the highest score in this challenge.